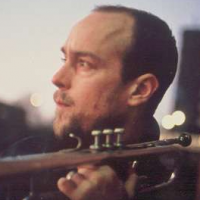 Tune in to the Musician’s Show Wednesday, May 24 from 6:00-9:00 PM for a live interview with Dave Douglas. Douglas is a prolific trumpeter, composer, educator and entrepreneur from New York City known for the stylistic breadth of his work and for keeping a diverse set of ensembles and projects active simultaneously. His unique contributions to improvised music have garnered distinguished recognition, including a Doris Duke Artist Award, a Guggenheim Fellowship, an Aaron Copland award, and two GRAMMY® nominations. While his career spans more than 50 recordings as a leader, his active projects include his Quintet; Sound Prints, a quintet co-led with saxophonist Joe Lovano; Riverside, a quartet co-led with Chet Doxas; Present Joys, a duo with pianist Uri Caine; and High Risk, an electronic ensemble with Shigeto, Jonathan Maron, Ian Chang and Geoffrey Countryman. As a composer, Douglas has received commissions from a variety of organizations including the Trisha Brown Dance Company, Birmingham Contemporary Music Group, Norddeutscher Rundfunk, Essen Philharmonie, The Library of Congress, Stanford University and most recently, Monash Art Ensemble, which premiered his chamber orchestra piece Fabliaux in March 2014. Douglas has held several posts as an educator and programmer. From 2002 to 2012, he served as artistic director of the Workshop in Jazz and Creative Music at The Banff Centre in Canada. He is a co-founder and president of the Festival of New Trumpet Music, which celebrates its fifteenth anniversary in 2017. He is currently the faculty at the Mannes School of Music and is a Guest Coach for the Juilliard Jazz Composer’s Ensemble. In 2016, he accepted a three-year appointment as the Artistic Director of the Bergamo Jazz Festival. In 2005 Douglas founded Greenleaf Music, an umbrella company for his recordings, sheet music, podcast, as well as the music of other artists in the modern jazz idiom. Greenleaf Music has produced over 50 releases and celebrated its tenth anniversary in 2015.